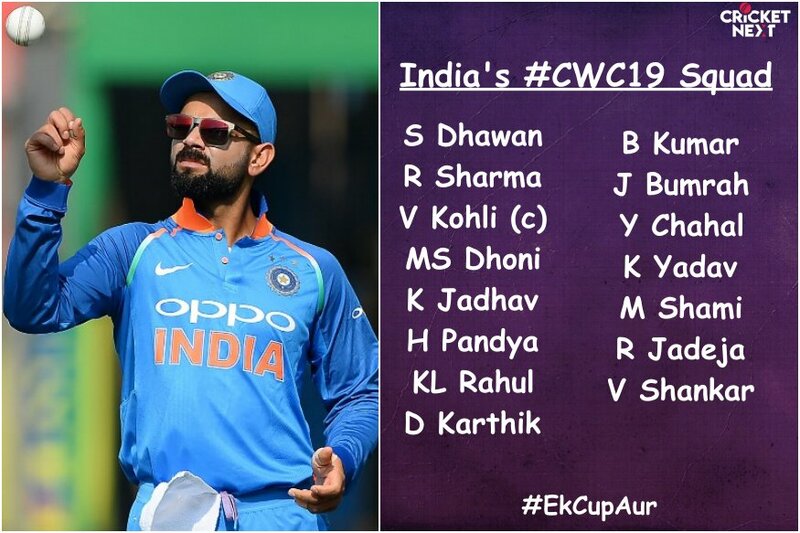 INDIA on Monday announced the Squad for 12th edition of the Cricket World Cup to be hosted by England and Wales from Thursday, 30 May to Sunday, 14 July 2019. 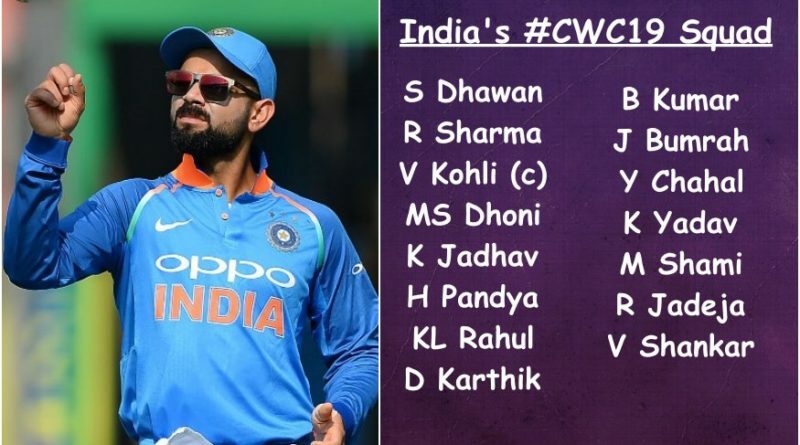 India has named Vijay Shankar, Dinesh Karthik and KL Rahul in the squad for the upcoming World Cup .Ambati Rayudu and Rishabh Pant were left out of the squad, which also has a place for Ravindra Jadeja. Mahendra Singh Dhoni will be representing India for the fourth time. He had led the Indian team in triumphing over Sri Lanka in the 2011 Cricket World Cup on home soil. They were also runners-up at the 2003 Cricket World Cup, and semi-finalists thrice (1987, 1996 and 2015). They came last in the Super Six stage in the 1999 Cricket World Cup and have been knocked out 4 times in the Group stage (1975, 1979, 1992 and 2007). India’s historical win-loss record at the cricket world cup is 46-27, with 1 match being tied and another one being abandoned due to rain. 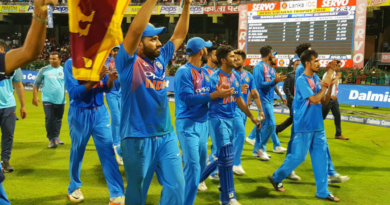 Squad: Virat Kohli (c), Rohit Sharma, Shikhar Dhawan, Vijay Shankar, MS Dhoni, Kedar Jadhav, Hardik Pandya, Ravindra Jadeja, Mohammed Shami, Kuldeep Yadav, Jasprit Bumrah, Yuzvendra Chahal, Bhuvneshwar Kumar, KL Rahul, Dinesh Karthik, announcing the team chairman of the selectors MSK Prasad in Mumbai said: at a press conference .There had been a lot of talk regarding the potential number four for India, a pain point that the team has been trying to resolve for quite a while now. Vijay Shankar will now bat at two-drop, as revealed by chairman of selectors MSK Prasad. The reserve ‘keeper slot has gone to Karthik, while KL Rahul will be the backup opener. Karthik was preferred over Pant due to his superior ‘keeping skills, Prasad added. KL Rahul will be reserve opener, if need arises the team management will take a call,” he said adding a few other bowlers will travel along with the team, as net bowlers, but added that they will be named later. Replying to a query Prasad said that performances at the ongoing IPL were not considered by the selectors. This meant that Pant’s 245 runs in eight games didn’t count for much as compared to Karthik’s 111 runs in the same number of matches. Commenting on the selection of the team former cricketer turned commentator Sanjay Manjrekar said it is impossible to keep everyone happy with team selections but Karthik inclusion is surprising. Selectors are guilty of showing no consistency in his case. Discarded after Jan 2019 to select straight for the WC. Shankar is a lucky man to make it, he added. “This squad was very close to the side we picked against Australia. We didn’t consider IPL form. The likes of Iyer and Shubman Gill are doing well but they were not considered,” Prasad said. There will be a total of 48 matches. In the eleven ICC Cricket World Cups held so far, five different teams have won the tournament. Australia is the most successful World Cup team having won the tournament five times, and was runner up another two times. West Indies won the first two tournaments, and India has also won it two times. In addition to winning the 1983 Cricket World Cup under legendry Kapil Dev and 2011, they were also runners-up at the 2003 Cricket World Cup, and semi-finalists thrice in 1987, 1996 and 2015.